Our billing and automation solution Billia has already proven itself to be one of the most advanced and flexible software of its type! At the same time, we constantly continue to improve it in order for it to become even more intelligent and easy-to-integrate for hosting providers, telecoms and IT businesses. Our recent updates added numerous new functionalities and improvements to Billia. Among them are the Billia Cloud integration, the email A/B testing option and the refined customer portal and management panel in Billia 3.7. The new Nginx Unit focuses on performance and optimization introducing changes that minimize the use of resources by applications. Unit can launch apps in different languages and versions which means easier management and higher productivity of the system. Moreover, Nginx Unit provides a more secure and isolated environment for applications resulting in better app failure handling and high level of flexibility. What does all that mean for us? Better performance! Billia now runs with greater level of efficiency and productivity. The migration to Nginx Unit provides more resilience and control when managing your software applications. Changes would not require a restart or reload of the system and will occur instantly since Nginx Unit is a dynamic application server. ...and probably the most significant step forward: The container’s image footprint of our software now decreases four times making it much easier for deployment in your environment! We also managed to reduce the software build time with 64% which, in numbers, means under 10 minutes for the process completion! PHP 7.3 came with several updates focused on syntax improvement and mainly on overall performance speed. Billia Engine is now compatible with the latest version of the scripting language which allows for several improvements. Why is it important for us? Because the migration to PHP 7.3 leads to over 22% increase of speed and boosts the overall performance of Billia. And who doesn’t like faster service and better performance? These are just few of the numerous updates coming with the new PHP version. Last but not least, we are excited to announce that Billia Engine is updated to use OpenSSL for encryptions! For us this means more security and safety for sensitive data and files due to the aes-256 encryption algorithm used. Thus, we provide a secure way of keeping important information in the database that should not be visible to anyone else, except for the client. Only they can access it via a unique encryption key. You can check out more about OpenSSL and the way it secures communication over computer networks on the OpenSSL official website. To sum up: Higher speed and more security is what you are getting with Billia’s newest update. 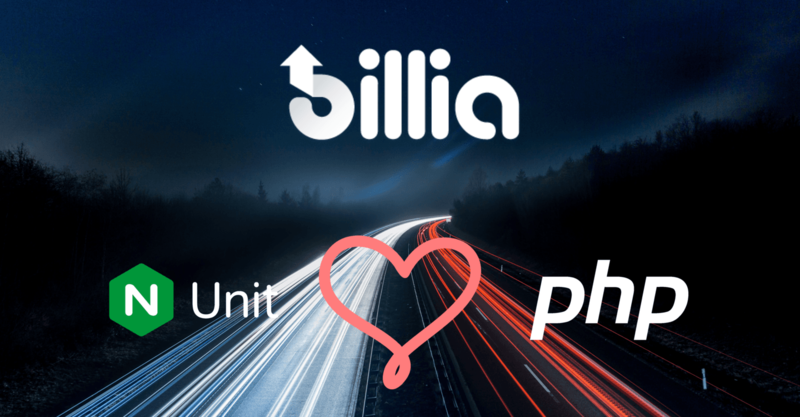 The Nginx Unit and PHP 7.3 integrations together bring better performance and lay the basis for a seamless integration of Billia with your business. And yet - that’s not all! We never stop refining our solutions towards the best and most innovative versions they can become. So expect our next big move very soon! Meanwhile, why don’t you get in touch with us and see how Billia can work for your business? Just tell us what you need, and you could end up with a tailor-made billing software that fits all your business needs! The best of it all is that you wouldn’t be putting your business at risk due to the €100,000 guarantee that Billia comes with.